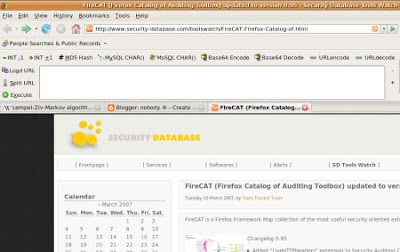 Yesterday, i implemented FireCAT a.k.a Firefox Catalog of Auditing Toolbox at my browser (firefox 2.0 running on ubuntu), FireCAT is a Firefox Framework Map collection of the most useful security oriented extensions. 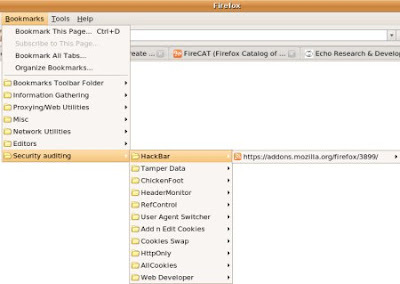 The basic idea is using "popular" web browser (in this case "firefox") and its extensions (developed by ethical hackers and coders) to perform pentests and audit assessments. u can download the OPML here then import it to bookmark, or u can download it manually. and else.. , so "No more Top 100 security tools, no more LiveCDs and no more exploitation frameworks. 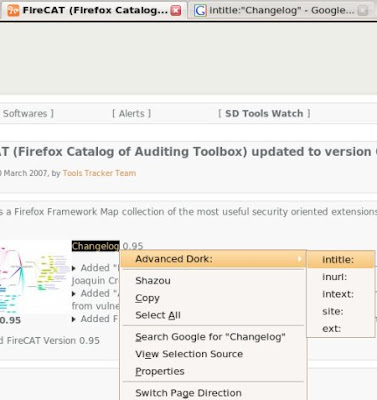 A security auditor without toolbox is like a cop without gun."